Scott loved tucking his face into the wrap to block the sun! Now don't get me wrong, I absolutely love having a stroller at the parks. But when Kat and Scott were little, having a baby carrier was a life saver. 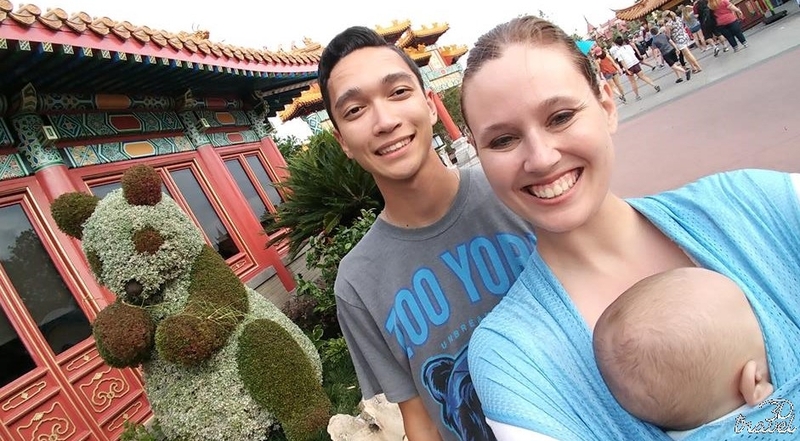 For Kat's first visit to Walt Disney World, it was just her and I together in the parks. 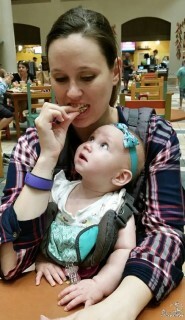 Being a brand new first-time mom, I had no idea what to expect, and I only had help at night when we rejoined my mom and sister (my sister was competing in a cheer competition). 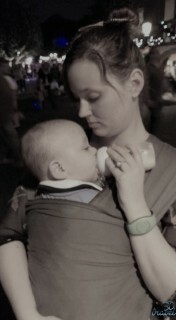 So while at the parks I used my Infantino Flip 4-in-1 convertible carrier. I didn't bring her stroller with me to the parks because I was worried it would be too much trying to break it down for the buses. 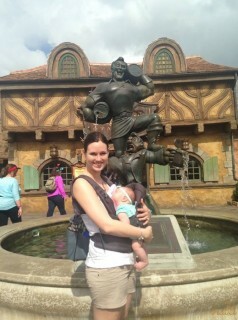 We love visiting Gaston's Tavern! For the most part this worked out really well. The biggest issue was that I didn't take into account the heat (it was March, but Kat had the carrier on one side and my body heat on the other-it got hot quick!) I quickly realized that the outfit I put her in the first day was too heavy once paired with the carrier and the heat. A good way to mitigate this issue is a cooling rag-it will help keep you and your little one cool! The other issue was the straps on this carrier. While I loved the Infantino for a short duration, when I wore it for an entire day it was slightly painful. This is because it can only sit on one spot on your shoulders, so there is no way to even out the pressure. If there had been someone else to split the baby wearing with, I think this wouldn't have been a problem. 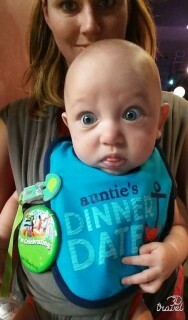 Once Scott came along, I traded in my Infantino for a Moby wrap. Scott's first trip was in April at 4 months old, and I used my Moby as well as a Beachfront Baby Wrap for this trip. The Beachfront is a waterproof version of the Moby, and is a little shorter with a lighter material-perfect for pool trips and hot days! Where Kat was always more than willing to chill in a stroller when she was little, Scott almost never sat on his side of our double stroller this trip. I carried him constantly for all 8 days of this trip, with the breaks here and there when my husband Dakota took over or we tricked little Scott into sleeping in the stroller. This is where the Moby wrap excelled. Unlike the Infantino, you have to do some work to set up your wrap, so it will take an extra minute or two to get the wrap ready. 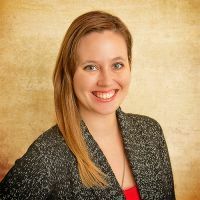 But what I loved about the wrap is that there are many different hold styles, so you can mix it up to what works best for you and your little one. There are many great tutorials on the internet, so learning the different styles was super easy. Scott liked to sleep in the wrap with his head tucked into the wrappings, so I had to adjust mine slightly to make sure he had constant air flow. The wraps also distribute pressure more evenly, helping alleviate unnecessary aches after all day wear. 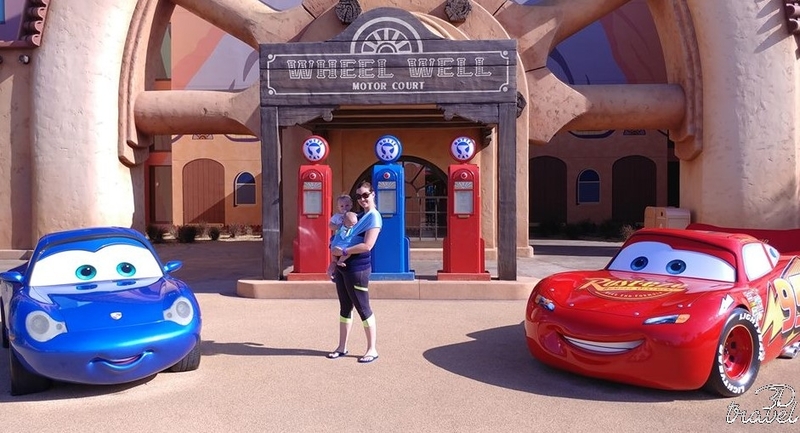 Hanging out with Lightning McQueen and Sally! 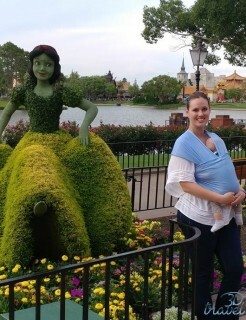 The great thing about baby wearing at the Disney Parks is that it keeps your little one safe while also keeping you hands free. 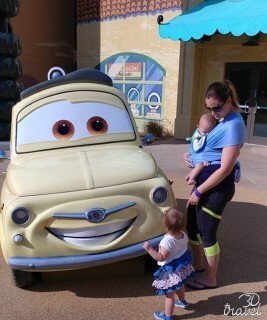 This makes it easier to get on and off rides, since you aren't having to hold the baby in one arm and stabilize yourself with the other. It also makes eating easier when you grab those on the go snacks! But I think my favorite thing about baby wearing when we visited the parks is that it helped keep my little ones more comfortable. Being up close with mom (or dad) can keep them calm and happy during even the busiest park days. 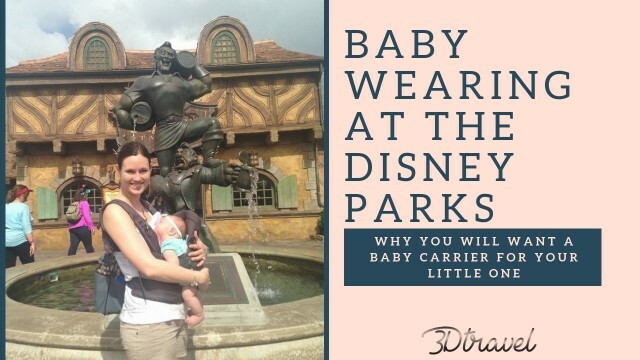 So if your taking an infant to the Disney Parks, I highly recommend bringing along either a carrier or wrap. That's all for now, join us next time on the Toddling Travelers! Wait? Travel Agents Still Exist? !